Even though Dinosaurs went into extinction more than 50 million years ago, they are still an interesting topic of discussion. T-rex or Raptor, Cory or Onyx, kids love them and that’s why dinosaurs are awesome toys for kids and toddlers. Kids love playing with them when roleplaying or using their superheroes to handle the destruction caused by these creatures. These toys are great because of their educational and developmental values. 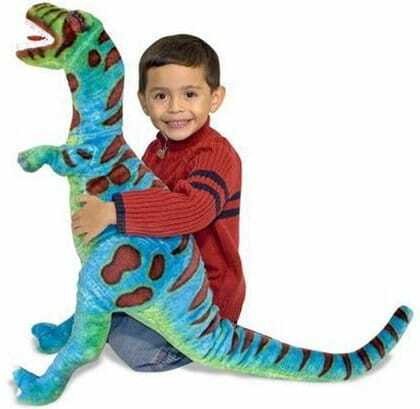 Dinosaur toys help kids and toddlers hone their creativity, imagination and much more. It is easy to get overwhelmed by the wide variety of Dinosaur toys available in the market right now. Therefore, the following review is a collection of the best dinosaur toys for kids and toddlers. You will find a great many toys, most of which you likely had no idea existed. Why we like it: This toy set brings together some fun educational inspiration and is a great addition to your child’s toys. This toddler-friendly and super-cute set of four dinosaur toys is the right gift for kids and toddlers. Each of the dinosaurs has been constructed from child-friendly plastic and features all the details from the prehistoric age. The pieces have been brightly colored using the primary color schemes and can be used as educational toys in many ways. The advantage of using this fun toy is that it enhances your child’s development of creativity and motor skills. It meets the needs of a large age span and is nice for a family that is growing. 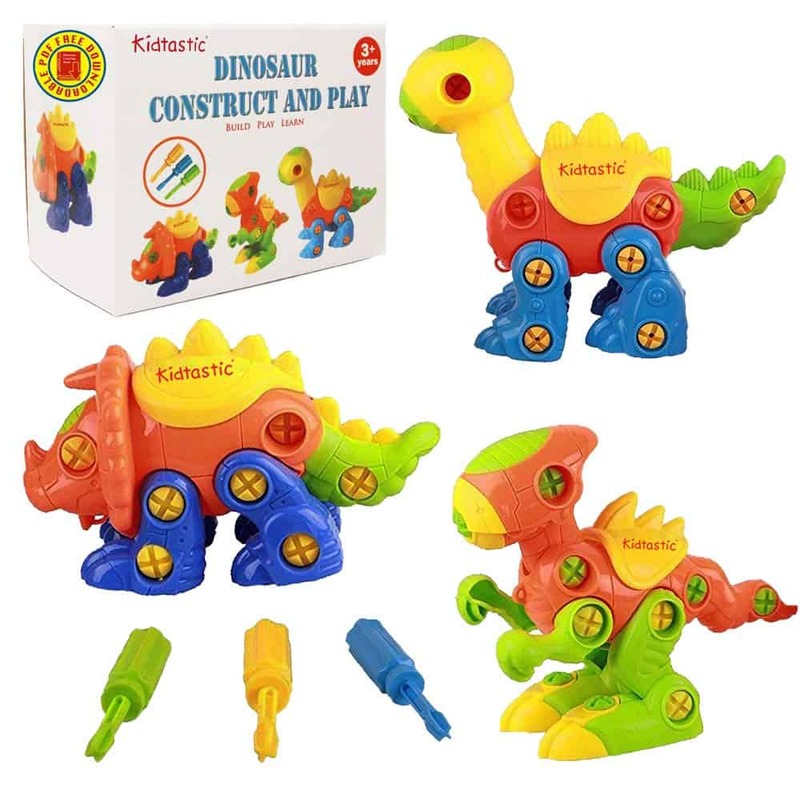 The dinosaur toys in this set are constructed from child-friendly materials such as BPA-, lead-, and phthalate-free plastic. Usage of this set of toys encourages fine-motor-skill development. It promotes imaginative and creative playtime activity for kids and toddlers. 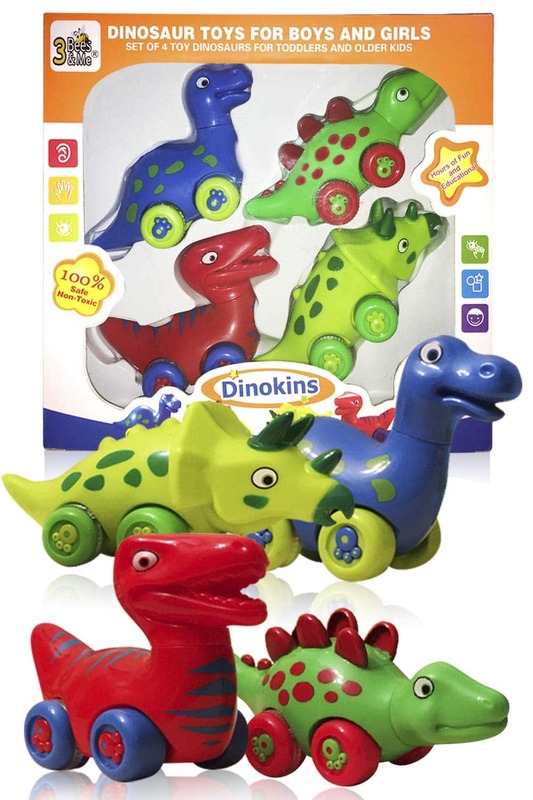 The dinosaurs in this toy set feature wheels constructed from thinner plastic as legs. One of the dinosaurs toys feature spikes on the back that can be easily broken off. Why we like it: The Laser Pegs Building Kit is a great way to help your kids improve their spatial reasoning, in addition to developing their planning skills and coordination. This is an engaging and lovely building toy for dinosaur enthusiasts over the age of five. They encourage kids to develop an interest in STEM subjects and engage a child’s creative side. 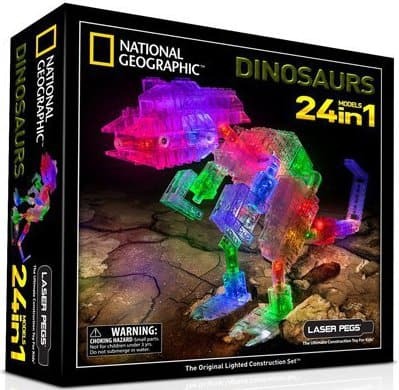 The box comes with building tools and instructions so that your kid can build 24 different kinds of dinosaurs. It may be necessary to help your kids when constructing dinosaurs. Once the dinosaur is built, it can light up and you can use it as a toy. You can place the completed dinosaur on a triangular stand, which makes sounds and a light show. The kit comes with 27 laser pegs and 191 building blocks all designed to be compatible with LEGO and other popular construction game blocks. This toy is a great way of improving your child’s spatial reasoning. It helps in the development of your kid’s planning skills and coordination. Laser pegs are a great choice for encouraging kids to develop an interest in STEM subjects. 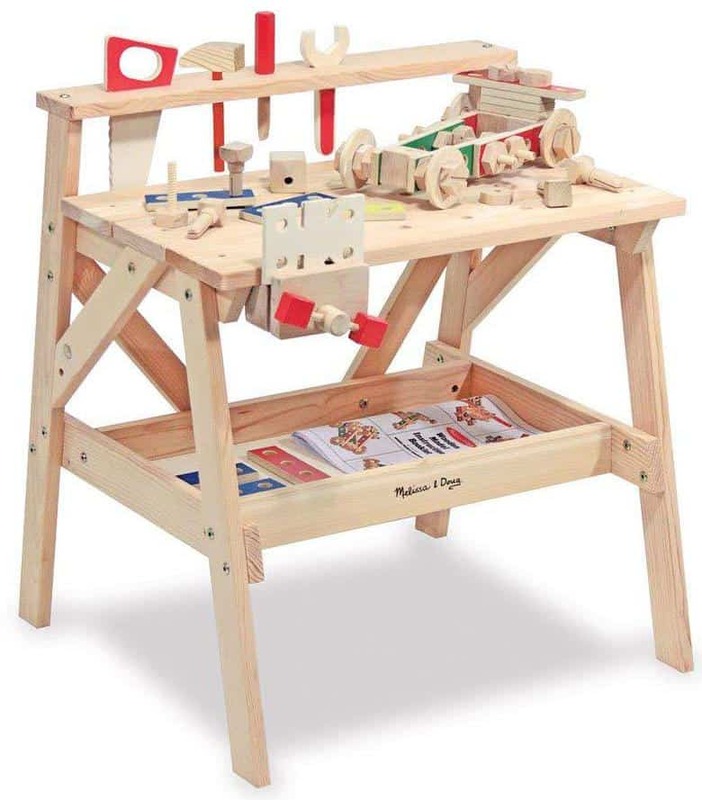 The pegs of this toy set will engage your child’s creative side. They feature a very high replay value. With the light show, this toy makes a great nightstand decoration. Some customers have complained of their sets coming with missing pieces. Why we like it: The tools, learning guide, and science factor make it a great learning experience, which also promotes the development of a kid’s cognitive ability and strong hand-eye coordination. 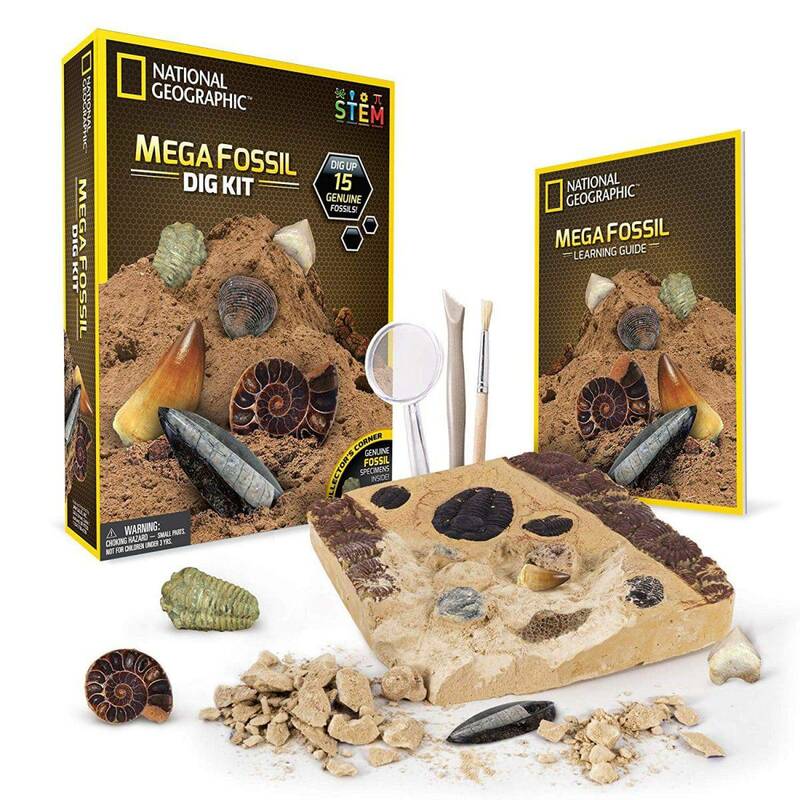 This paleontology-inspired toy comes with everything you need to excavate fossils with your kids. The tools include a chisel, magnifying glass, and brush. This set also features a 16-page learning guide with illustrated fossil facts. The learning guide will provide your young paleontologist with details of how fossils are formed and how they can easily identify each different specimen. Be sure that your kids will be digging for more information with this toy set. This toy set features detailed fossils of 15 different items. The set comes with a chisel, magnifying glass, and brush. It helps improve your child’s knowledge with the learning guide that illustrates fun fossil facts. Helps in developing your kid’s hand-eye coordination. It encourages the development of a child’s cognitive ability. Some of the sets do not include the 15 different fossils. The stone that features fossils is very hard making it necessary for your child to have adult supervision. Why we like it: This is a wonderful building block set that will keep your kids engaged and entertained for hours. The building blocks of this toy are ideal for your child to hone their fine motor skills. It allows kids to build their own firing breathing, green-eyed, large fanged and pointed clawed dinosaur. Besides, once done playing with the dinosaur, your kid can use the building blocks to build a spider or a troll. The 3-in-1 design will keep your kids entertained and engaged with the same toy for some time. The set comes with 223 pieces of building blocks and are great for both girls and boys. This LEGO Creator set is a toy that will give your kid endless hours of fun playtime. It will be fun watching your kids break the current dinosaur down and start building them again. The building block set features the assembling of a dinosaur that will measure 3 inches tall and 10 inches long once complete. The set comes with 223 pieces. The 3-in-1 design (dinosaur, spider, and troll) helps keep kids entertained and engaged with the same toy for endless hours. It promotes the development of a child’s fine motor skills. To complete the dinosaur, included are the fire breathing, green eyes, and large fangs, and pointed claws accessories. You can only build one creation at a time. Why we like it: This toy dinosaur lights-up, roars and moves along the floor offering an interactive experience, unlike most plastic dinosaurs. The Light Up and Walking Realistic Dinosaur comes with lights, sounds, and action-packed playing. This means that it can walk on its own, roar like a fearless dinosaur, and light up the room, giving you the Jurassic experience. The clear spikes on the dinosaurs back are illuminated by the blue, red, and green LED lights. The eyes and tongue have flashing lights. All these features give your little one an interactive experience. It is a good toy for a child to practice their motor-skill development. In addition, picking up and moving the figures and toys around is one of the best movements to one a child’s developmental skills. It offers an interactive feel since it lights up, walks, and roars. The toy comes with red, green, and blue LED lights. The toy promotes the development of a child’s fine motor skills. You can easily control the sound, lights, and movement using the on-off switch. The spikes on this toy’s back are lit up using the light-up feature. The dinosaur sounds play the entire time it is on making it quite irritating. The batteries used in this toy come too loose in the compartment. Why we like it: This dinosaur toy offers an educational experience that provides children with a STEM learning experience. This early-learning toy is ideal for toddlers and offers hours of endless play options. 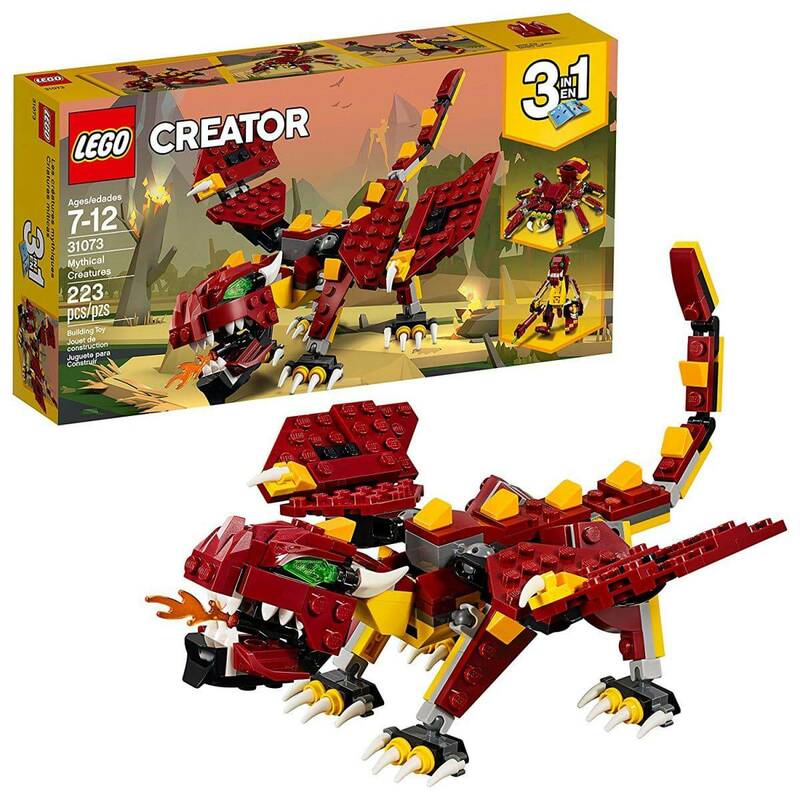 It allows your kid to create three different dinosaurs with the parts, tools, guidance, and more than 106 pieces. If your child feels like exploring, they can take each of the dinosaurs apart and rebuild them. This is vital in the development of a child’s skills and boosting their cognitive development. The dinosaurs are kid-sized and come with kid-sized screws an screwdrivers. Furthermore, there is a bonus downloadable coloring book for some extra playtime fun. You do not have to worry about the pieces becoming dirty from play since they are washable. Your kids will have a blast with this toy whether they are playing or building them. 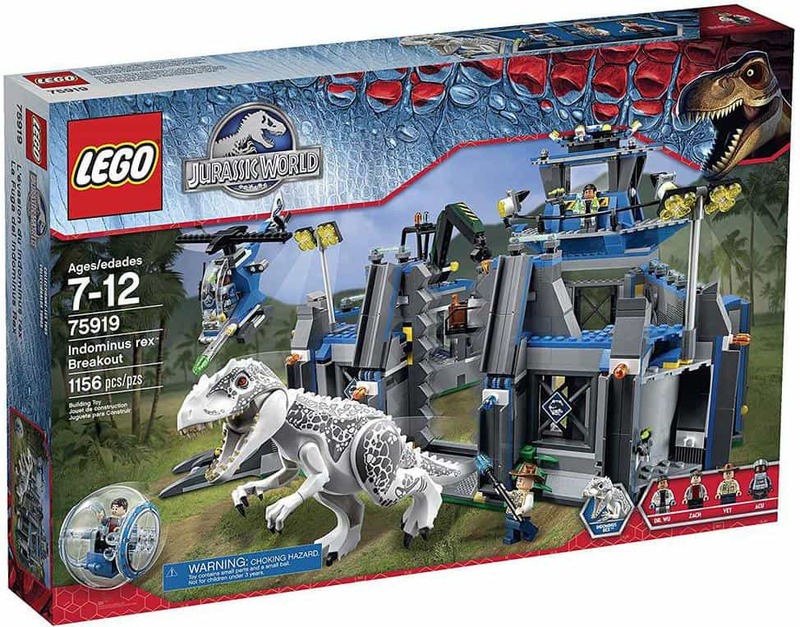 The set comes with 106 pieces used to assemble the dinosaurs. The dinosaurs come when fully assembled. The downloadable coloring book offers extra playtime fun for kids. It offers an enhanced STEM learning experience for your kids. This toy boosts your child’s cognitive development. The pieces that make up the dinosaur are small in size and may get lost easily. The fully assembled dinosaurs are difficult to get a part for the first time. 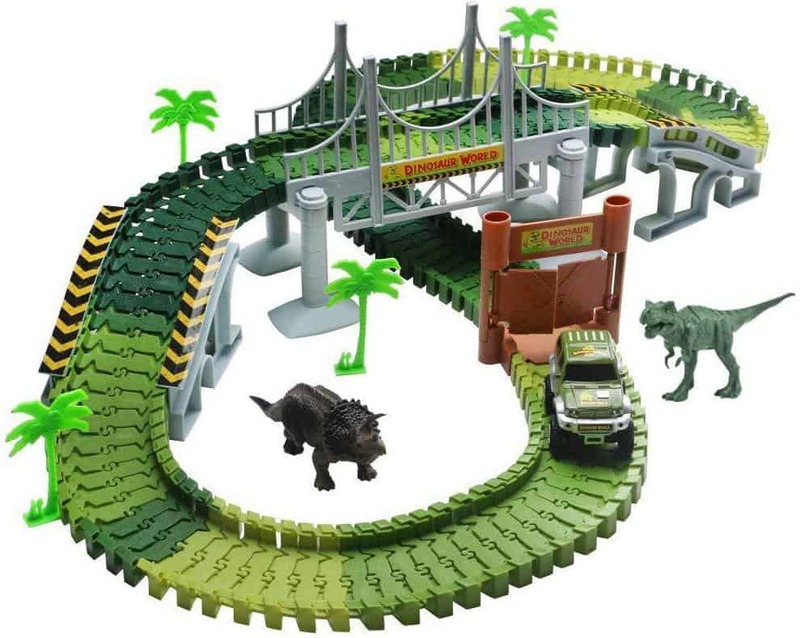 Why we like it: This dinosaur themed track set is a wonderful way to stimulate kids’ minds and also allows them to be able to express their creativity. This premium race track will spark your kid’s curiosity and stimulate their minds. The track easily twists, flexes, and snaps together to create many different combinations. This track offers endless possibilities such as being looped in a 360-degree circle. The design of this track makes it easy to assemble and disassemble. The track is going to be huge with kids when the cars run in and around the dinosaurs. The toys have been constructed from environmentally friendly materials and are not harmful to anyone playing with them. The set comes with 142 pieces of race car track, 2 large dinosaurs, a car, 4 trees, a door, and one hanging bridge. 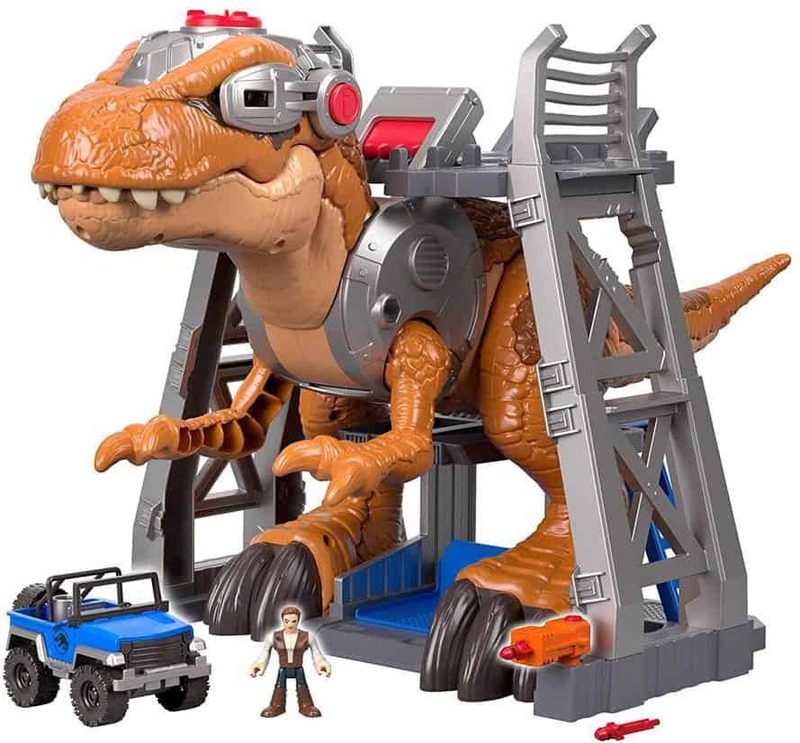 It is suitable for both big and little kids and the dinosaurs that come with this set are neat and have a lot of details. This is a dinosaur themed race car track set that is huge with kids. It has a flexible track that can be turned, twisted, and formed to make different tracks. It has been constructed from environmentally friendly materials. It encourages the development of creativity for kids and toddlers. The cars used in this track consume more power eating through the batteries quickly. The hanging bridge does not stay together well. Why we like it: This realistic looking dinosaur helps strengthen your kid’s counterfactual reasoning and different problem-solving skills. 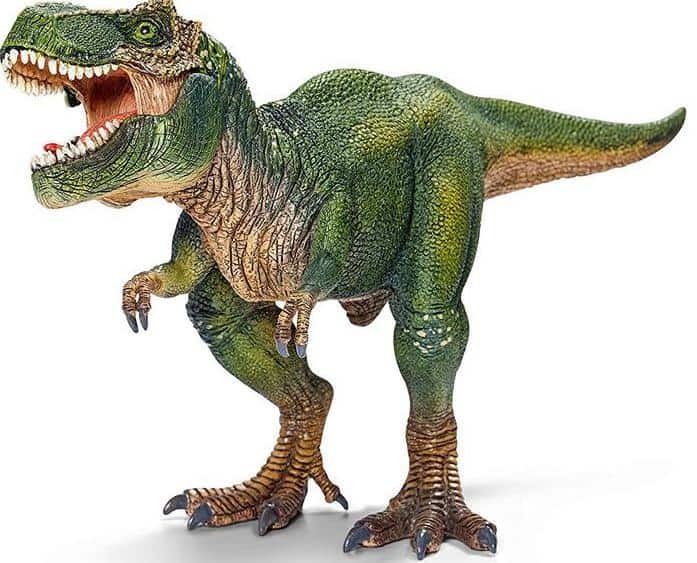 The Schleich Tyrannosaurus Rex is a realistic replica of the most fearsome and most famous dinosaur of all time. This can help your kid and toddler expand their full imaginations as they pretend to be roaming the jungle during the Jurassic period looking for prey. It helps in enhancing the imagination of a child making it ideal for encouraging creative thinking. It has been made of high-quality vinyl plastic and hand-painted with such realism that makes it a very interesting piece to display. The toy can last a lifetime due to the strong build and quality make. The toy enhances creative thinking and can encourage a child’s imagination because of pretend-play. The hand-paint creates a sense of realism. It is an easy toy for your child to operate. This toy has been made out of a high-quality vinyl plastic giving it a strong build. The toy’s movable jaw might become stuck. This toy might be too small for some children. Why we like it: This toy has been made from soft, cushiony materials that make it ideal as a sleeping aid, particularly for young children. 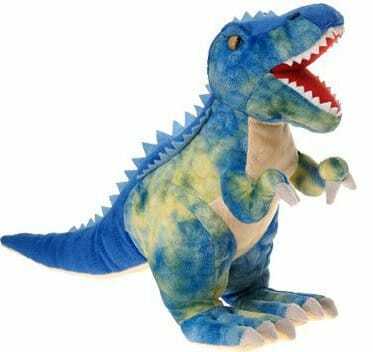 This adorable Melissa & Doug Giant T-Rex Dinosaur is a great addition to your child’s dinosaur toys. It has been made from high-quality, colorful, and detailed fabric that displays all the cool features of the prehistoric dinosaur. The very colorful body of this dinosaur helps kids reinforce their color recognition besides being ideal for a child’s imaginative and make-believe play. This toy is sturdy and durable but still maintains its softness making it not only fun to play with, but rewarding for hugs as well. 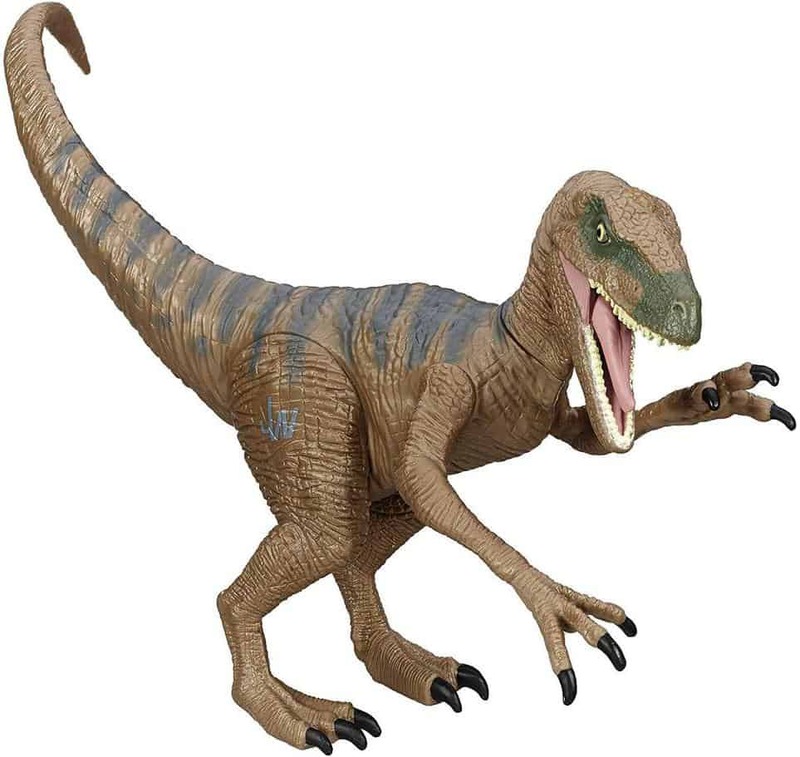 The lifelike size of this T-Rex gives your child a personal connection and helps encourage their imagination. It has been constructed from top-quality detailed polyester fabric. It features a durable and sturdy design that is great for kids of all ages. It can stand upright on two feet so you do not have to worry about the toy getting in the way. The super plush T-Rex can be used as a sleeping aid for small children because of its softness. It promotes imaginative playtime in addition to giving your child a personal connection. It has been constructed with a wire frame that can likely come out of the fabric. The legs of this toy can easily break. Why we like it: The convertible box provides ease of use as it can go from a storage box to a colorful play mat. It can also fit perfectly within closets and corners. This collector box makes it easy for your kids to take their toys along and once they are settled, they can unzip the box into a colorful and fun play mat. 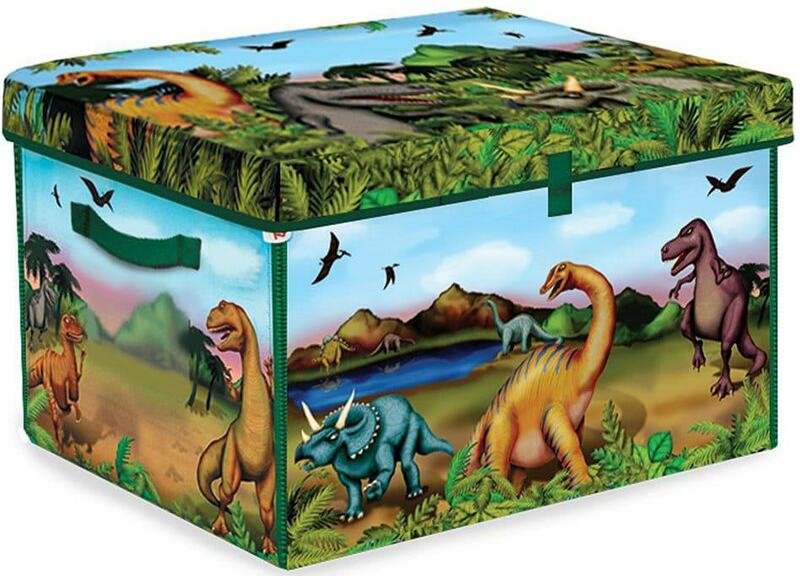 The toy box features graphics displaying a prehistoric scene inspiring your kid’s playtime. Furthermore, the box has been constructed to be sturdy, stackable, and strong. The box comes with two dinosaur figures but can hold approximately more than 160 dinosaurs along with other toys. With this box, it will be quite easy for kids to store and take their toys along. It has a high storage capacity and can hold up to 160 dinosaur toys. The toy box has been constructed to be stackable, strong, and sturdy. It can convert into a fun play mat with prehistoric graphics. It features two dinosaur action figures with a set. The sides of the box have been secured with Velcro, which can become loose over time. It is necessary that you review the dimensions before buying since the box has been made to be storage and carry friendly. Why we like it: This is an interactive oversized T-Rex that has super cool actions, lights, movements, and sound. This big, boney, and interactive dinosaur toy features sound and movements with every turn. It is a great toy to create prehistoric adventures right from the playroom floor. Besides all the cool sounds, the Ultra T-Rex makes, it can stand, fire projectiles, chomp, and launch fun boulders. The multiple number of interactions makes it one of the favorites for any dinosaur or interactive toy lover. It is a great toy to promote gross and fine motor skill development for your kids and toddlers. The adventure that starts with this toy will be quite epic in any child’s eyes. The T-Rex comes with three warrior-themed figures having helmets and accessories, four boulders to fire, and four projectiles. It is ultra-large and an interactive dinosaur character. It features movements such as standing, firing projectiles, chomping and launching fun boulders. This massive toy comes with sounds and lights to show its dominance over other toys. The T-Rex comes with three figures, four projectiles, and four boulders. It is a great toy for promoting gross and fine motor skill development for kids. Due to its interactive nature, it consumes lots of batteries. It does not have any sound controls or voice minimizer. Why we like it: This interactive board game is a great choice for kids who get very intense about playing board games and hate losing. 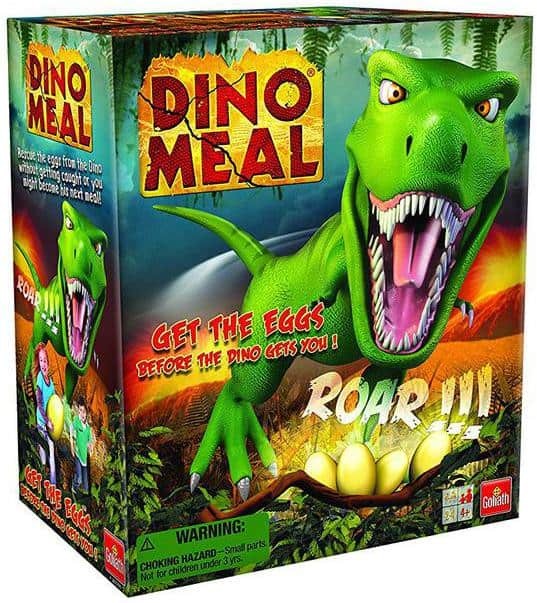 The Dino Meal is a board game for two to four players and is incredibly tense and dynamic for kids and adults alike. It requires precision, luck, and practice. It features colorful dinosaur eggs and a fierce T-Rex that lunges when you try to retrieve an egg from under its nose. The way the T-Rex lunges will make it hard to keep up a grudge about losing points. This game is very good for a child’s social and cognitive development. In addition, it teaches patience and improves dexterity while helping improve your child’s confidence. This game helps in the social and cognitive development of your child. It helps improve dexterity and patience. It helps boost a child’s confidence. It’s a cute and fun game for Dino lovers. It requires no skill to play. Some customers have complained that it doesn’t work even when you plug in new batteries. The Dino does not attach properly. Why we like it: This book can withstand the abuse that kids will put it through. You do not have to worry about it tearing easily and can withstand spills too from little kids. 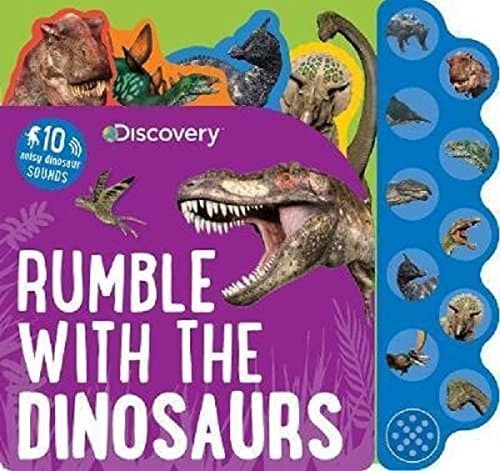 The Discovery Kids Dinosaurs Book is an interactive educational toy that is best suited for your kids and toddlers. It features ten sound buttons, each associated with a different type of dinosaur. The sound effects are fun, and the illustrations bright and engaging. Your kid will have an excellent tactile experience while turning the pages and pressing the buttons. Besides, the book will provide interesting and accurate facts about prehistoric life. Since it will not easily fall apart, these books will last you for a few years. It is durable since it does not fall apart easily. It gives kids an excellent tactile experience while pressing the buttons and turning the pages. It’s a great educational toy that provides interesting and accurate facts about prehistoric life. It is an exciting and entertaining book for Dino lovers. The sound does not work on some of these toys. This book does not have an accessible battery for replacement. Why we like it: This adorable toy is washable and portable, so your kid can take them anywhere. Since they are large enough to hold on to, it cannot be easily misplaced. 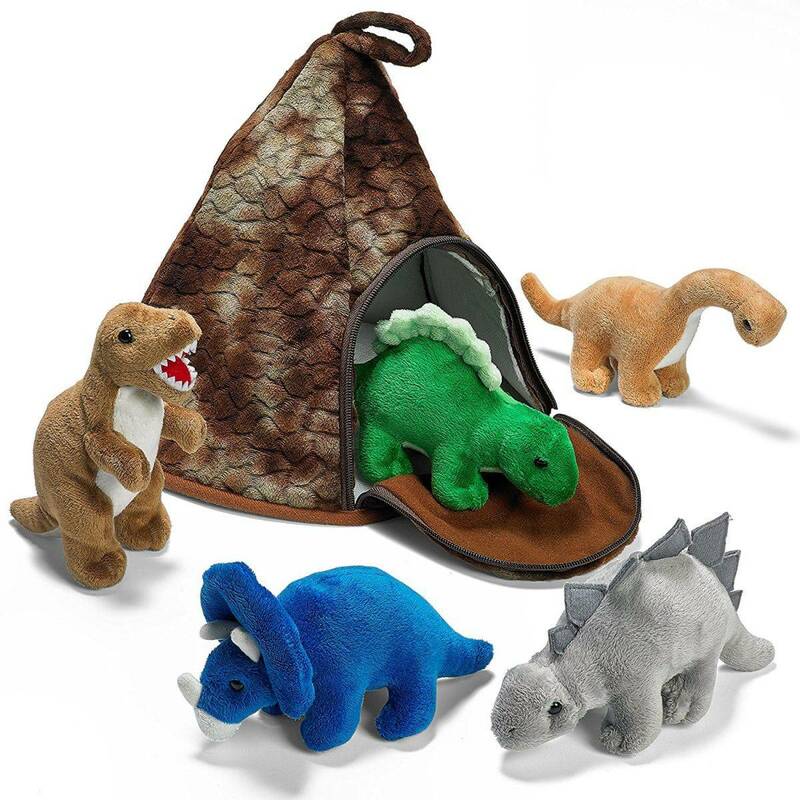 This toy comes with five friendly plush dinosaurs and a pyramid-shaped volcano bag to store them in. The pieces in this set are handcrafted with detailed attention to the dinosaurs, and durable as well. You can go anywhere with this toy making it great for your kids when traveling. It is great for kids since it encourages imaginative play and creative thinking. It helps in the development of a child’s creative thinking by encouraging imaginative play. This toy is great for cars and planes since it is very easy to pack and carry. The toys have been handcrafted giving detailed attention to the dinosaur features. The toys have been so well made meaning they are durable. Why we like it: You can easily make this pool into a ball pit when you are not using it as a pool. The prehistoric design will also allow kids to include this in different types of games. 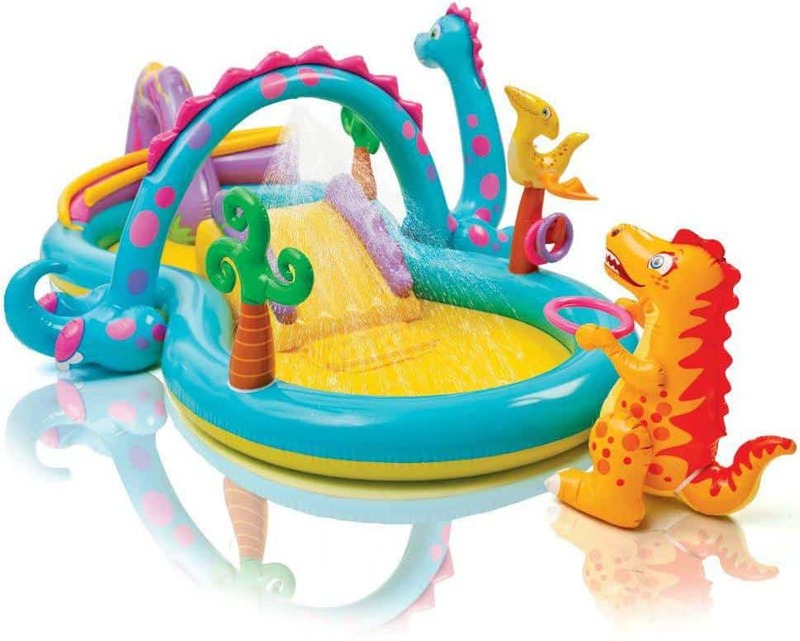 This inflatable dinosaur-themed kiddie pool is perfect for high-energy kids that love splashing around. The Homelux Inflatable Dinoland Play Center will get your kids out of the house since it is well suited for outdoor play. It features a water hose that will spray your kid from above. The inflated dinosaur figures make it more attractive to use it in the pool in addition to engaging your child’s imagination. It has a slide with a gentle slope and a soft landing pad. It is a good toy for cooperative play and will provide an excellent and safe source of entertainment. It has a safe landing pad so that there are no risks of injury. Suitable for outdoor plays encouraging your kid to go outside more. The dinosaurs engage a kid’s imaginative thinking. It is huge, bright, and colorful. You have many different fun things to do including slide, ring toss, hoops, and ball trails. The package does not come with a pump and it may be necessary to buy it separately. Some customers have complained that it has some leakages. Why we like it: This is a great toy for kids who love collecting rocks. It has a number of developmental benefits that can help your kid fall in love with natural sciences. 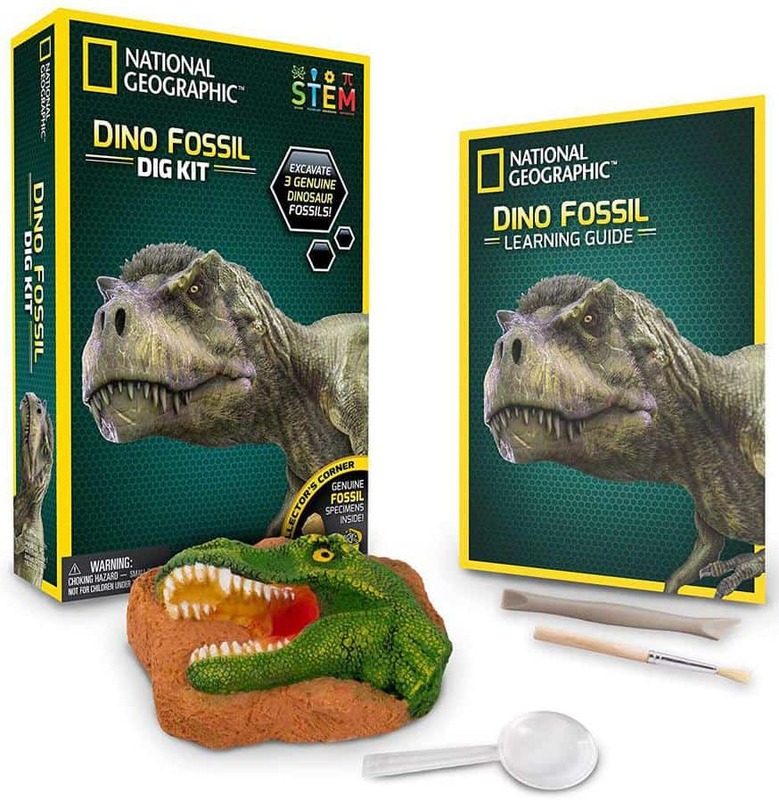 This National Geographic Dinosaur Dig Kit comes with archaeological tools that help your kid dig through the brick and find three ancient fossils. Your child can also use the magnifying glass to study the fossils. The fossils are real and have a dinosaur tooth, a shard of bone, and even fossilized dinosaur droppings. It will take time to dig through the bricks, therefore requires a sense of determination. However, the excavation process is exciting too. The kit comes with plenty of information about the dinosaurs. It has real fossils in it. It will keep your child engaged with the amount of time it will take to dig through. This toy will help build a sense of determination in your child. It has a number of developmental benefits for your child such as building cognitive ability. Some people may not have the patience to dig through the solidified litter. Why we like it: The book is fun and educational. 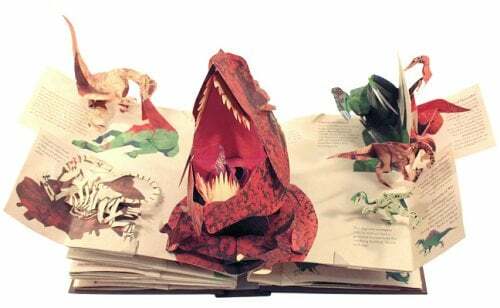 It will make your child fall in love with dinosaurs, but they might be just as impressed by the craft that was put into making these pop-ups. Children still adore traditional interactive books in this age of educational software. The illustrations in this book have been drawn with care and precision whereas the pop-ups are innovative and fascinating. It contains both well-known and obscure dinosaurs with the most impressive being the detailed t-rex skeleton pop-up. The humor in this book will keep your child entertained making it feel like less of a chore. This book has fold-out mini-books that contain more information in addition to engaging mysteries and more pop-ups. It is filled with humor on some outrageous moments in history keeping your child entertained. It contains illustrations drawn with care and precision. The pop-ups are innovative and fascinating. The fold-out mini-books contain more information making it a very unique and amazing book for kids. It will take some care and delicacy to fold the pages. Why we like it: Your kid can tell you a story based on the pictures on this set, helping them develop their creative ability. In addition, you can be sure that they will learn to cooperate and verbally express what they are planning to do. The Melissa & Doug Dinosaur Wooden Jigsaw Puzzle is ideal for kids that enjoy playing alone. This set comes with four different puzzles, each featuring a beautiful prehistoric scene with different species of dinosaurs. Every puzzle consists of 12 pieces, which makes it a great choice for kids. This jigsaw puzzle will help your child to develop their hand-eye coordination and precision in addition to helping in the improvement of their problem-solving skills. Once your child finished piecing every piece of the jigsaw puzzle, they will feel both accomplished and confident. The puzzles come with a handy wooden storage box to store the four different puzzles. It helps in the development of a child’s hand-eye coordination and precision. The jigsaw puzzles aid in the development of a child’s problem-solving skills. It is a high-quality toy and can last you long enough. Some customers have complained that it does not have all the items. The directions for assembling this bench are poor and you have to carefully look at the pictures to assemble it. Why we like it: This green inflatable toy is so huge with a lifelike design that will make a suitable companion for your kid. This toy is a great fan of dinosaur lovers. They can use it to decorate their rooms, collect, and play. The toy is made of durable plastic and will be with your child for most of their childhood. In addition, it will deliver hours of fun and make a cool display for any child’s room. 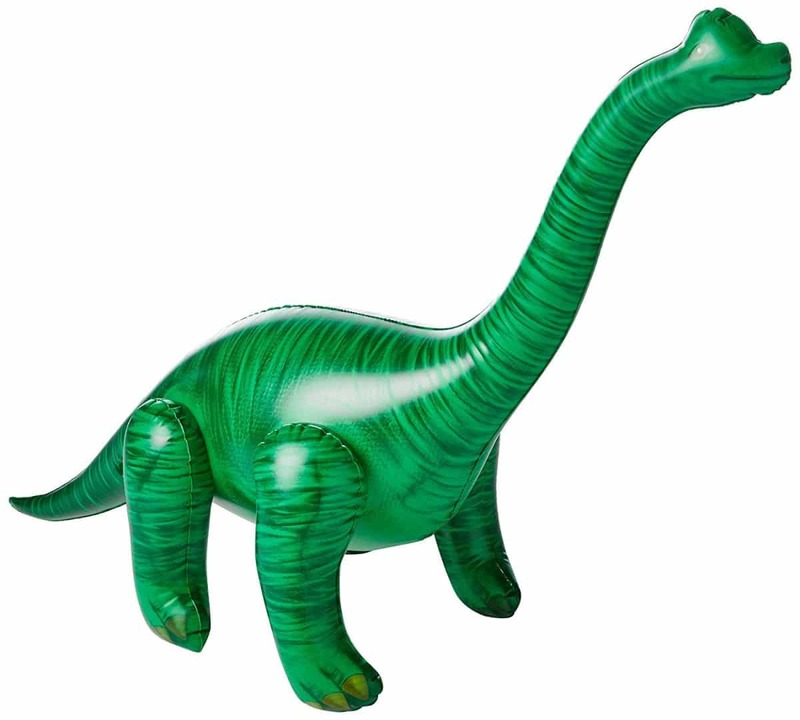 The package includes a repair kit in case the inflatable Brachiosaurus Dinosaur gets a puncture. It is also quite easy to repair the dinosaur. It has been made from high-quality plastic material that makes it durable. The proprietary design means that it will give you exceptional performance. The four color scheme on this toy makes for a captivating display when your child plays with it. It comes with a repair kit for any punctures and holes. It is also quite easy to repair these punctures and holes should they occur. Some customers have complained of holes along the seams, so it doesn’t stay inflated for long. Why we like it: This intricately designed Dino transforms into a fighter-jet and back to a dinosaur again. Your child can learn dinosaur facts and hear wild sound effects while playing with it. The 2-in-1 toy easily transforms from a fighter jet to a Spinosaurus and back again in just a few simple steps. Your child can launch food discs or save the included baby Dino with the rescue lift, cage, and crane. Your kid or toddler can squeeze the Spinosaurus’ tail to trigger roaring action and chomping. It features a dynamic LCD screen that comes to life at the push of a button and features cool pilot and dino eyes animations. What’s more, the realistic sound effects and phrases teach your child interesting dino facts. 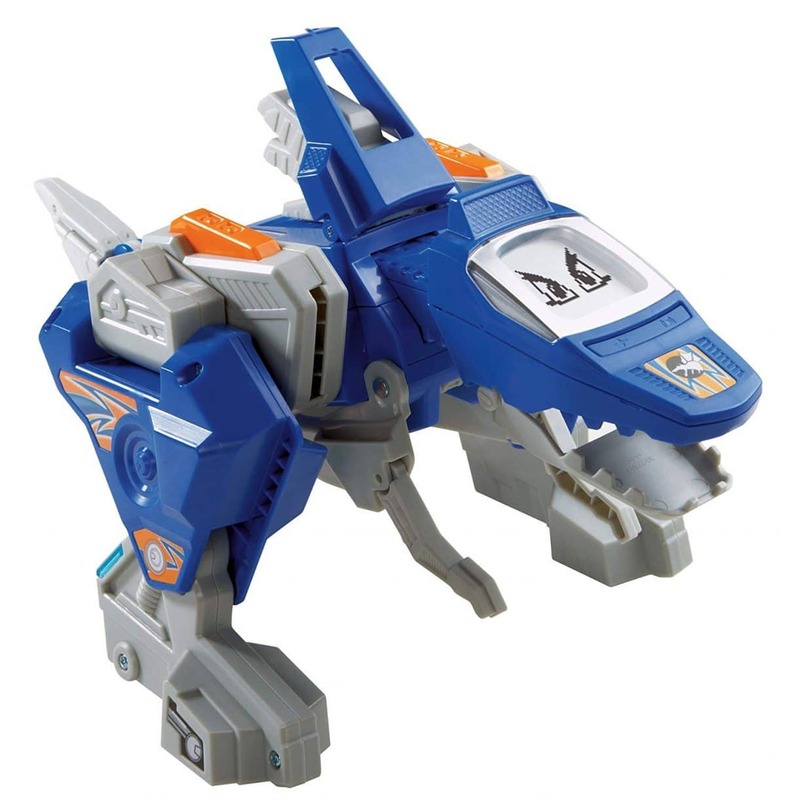 It features 2 modes since it can transform into a fighter jet and back to a dino. 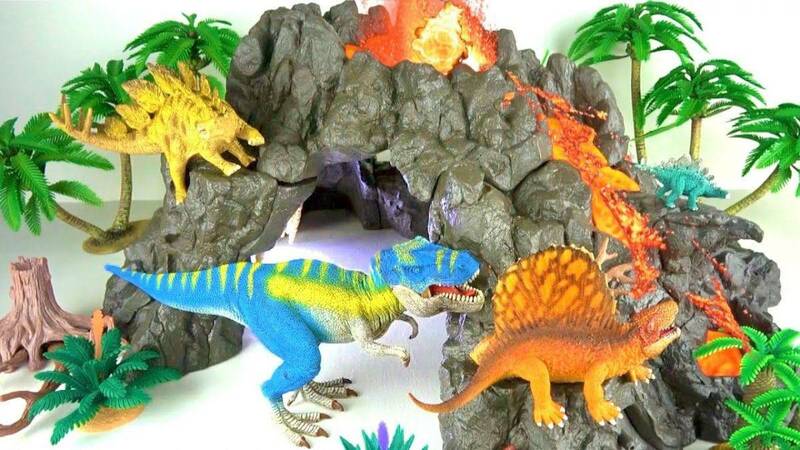 It will help your kid learn dinosaur facts with the wild sound effects and 70+ phrases. It features a dynamic LCD screen that displays cool pilot and dino eyes. It starts repeating some phrases despite having quite a number of them. It cannot withstand the abuse a child would put it through meaning some parts will come off after a few days of using. Why we like it: This Jurassic World toy is a stunning piece of artistic work. It features life-like black scales and ferocious looking claws that would certainly fascinate your child encouraging them to play pretend hunting. The Indoraptor figure has been intricately built from non-toxic material while its sturdy design ensures that it will be with your kid for the long run. It makes an awesome decorative piece in your kid’s room. The toy requires 3 AA batteries to power the movement of the mouth and legs. This is the real deal that has been featured directly from the Jurassic World movie franchise. It features movie-like qualities for realistic and imaginative play. It features multiple moving parts that make it interactive to play with. It is durable because of its sturdy design. It has been made from non-toxic material. The arms and tails break off easily. 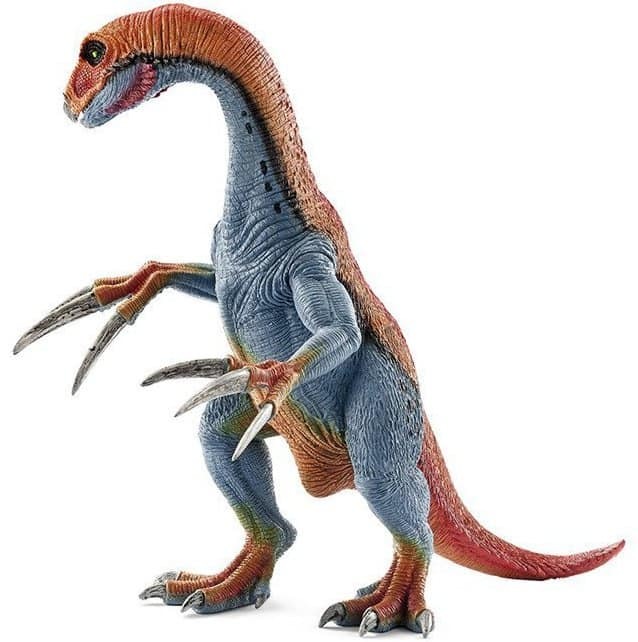 Why we like it: This Therizinosaurus Toy Figure features a very comprehensive design that makes it a very realistic-looking dinosaur. Any kid would learn a lot about it when studying its features. This toy features a striking gigantic claw that your child can use to defend it from other dinosaurs while playing pretend. A fun fact you and your kid can take along is the fact that the forelimbs of the actual Therizinosaurus were about a meter long. Therefore, the toy’s forearms may look disproportionately large, but that is an actual reproduction of the relative size. The toy has been hand-painted with non-poisonous colors and would make a fine decorative piece and a wonderful addition to other dinosaur pieces. The toy has been made with unparalleled attention to realistic scale and detailing. It is durable having been made from high-quality plastic. The hand-paint gives it a realistic look, which makes it a fine decorative piece. The movable claws and jaws provide an interactive playing tool for your child. It helps build a child’s imagination and creativity when they play pretend. The arms fall of easily. It requires a balancing act to actually make it stand up properly. Why we like it: This toy brings a lot of fun, activities, and adventures to the table. At 18” tall, the Jurassic World, T-Rex dinosaur takes fun and adventure to the next level. This toy has been well designed to give your kid complete control. The control comes via a handle on the dinosaur’s back. The handle allows your kid to open the dinosaur’s mouth and chomp on objects in addition to pushing the dinosaur forward and much more. The toy has been made using non-toxic hard plastic. The complete toy set comes with a single T-Rex, a holding base, projectile launcher, one vehicle, and Owen figurine. However, you need 3 AA batteries to use the toy. It has been made from non-toxic hard plastic. It is interactive and will help in developing a child’s cognitive abilities. It is easy to use and will offer endless hours of fun. The handle gives your child complete control of the toy. Why we like it: This affordable toy has been made from high-quality plastic and has a perfect size for playing as well. It features a giant ruff, a small horn, and two large horns on the forehead. 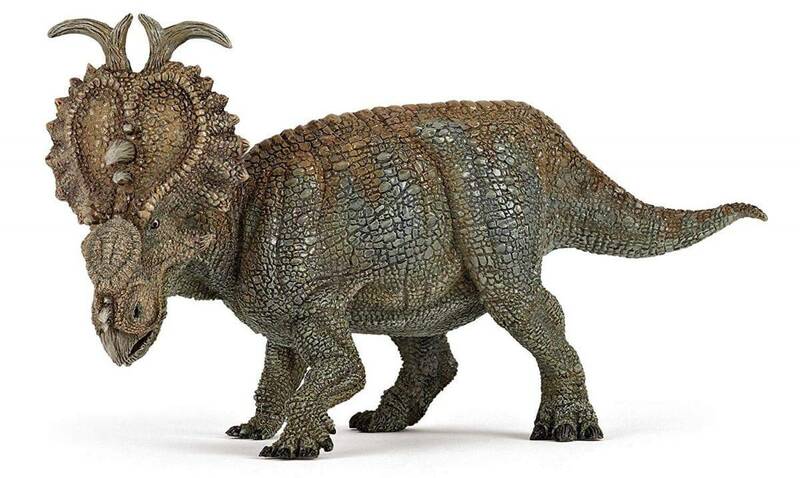 The Schleich Triceratops figurine is historically accurate and manages to capture the true beauty of the magnificent prehistoric creature. It features highly textured details and vibrant hand painted colors. In addition, it has been designed with the help of parents, teachers, and children. The size of this figurine is perfect for playing. It is good for displaying because of the vibrant hand painted colors. It is too hard and jagged for a small child. Why we like it: This toy has been made of lightweight, durable, dishwasher-safe plastic making it a favorite of any Dino lover. 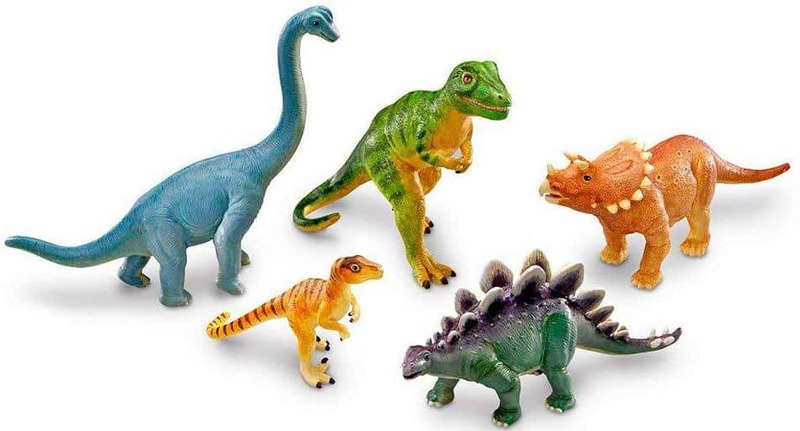 The Learning Resources Jumbo Dinosaurs contains 5 pieces of realistic- looking Dinosaurs. They include 2 carnivores; T-Rex and Raptor and 3 herbivores; Brachiosaurus, Stegosaurus, and Triceratops. The Dinosaurs are just about the size of an adult’s palm, the largest being the Brachiosaurus. Their coloring is very nicely detailed with good shadings and can give kids hours and hours of imaginative play. It includes an activity guide that will enable your kids to actively participate and interact during play. The plastic used to make these toys is durable enough to be used indoors and outdoors too. It’s very interactive and will help in developing your child’s cognitive abilities. It helps in the development of a child’s creativity. It filled with action that is bound to keep your child engaged for hours on end. It is made from high-quality plastic that makes it durable. The toy’s uniquely modeled textures will help spark your child’s curiosity for science. This toy is not dishwasher safe as described. They have been poorly molded and feature an intense chemical smell. Why we like it: This figurine has a wonderful texture making it a museum quality item. It has been made from very high-quality plastic ensuring it will last for some time. Papo the Dinosaur figure will surely spark not only the imagination of your kids but also the interests of Dinosaur figurine collectors and teachers alike. 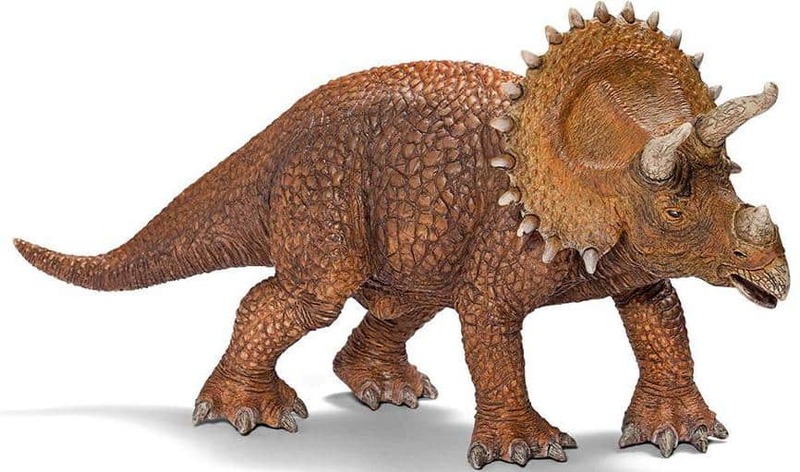 It measures approximately 6 inches long but manages to capture the elegant beauty of the Pachyrhinosaurus with its detailed textures and vibrant hand-paint. In addition, it has a detailed posture that gives it an animated feel making it look almost lifelike. It is an educational toy that will be a great addition to your child’s toy collection. It has been beautifully finished with detailed texture. It is durable due to the high-quality plastic it has been made from. It will spark a kid’s imagination and help develop their creativity. 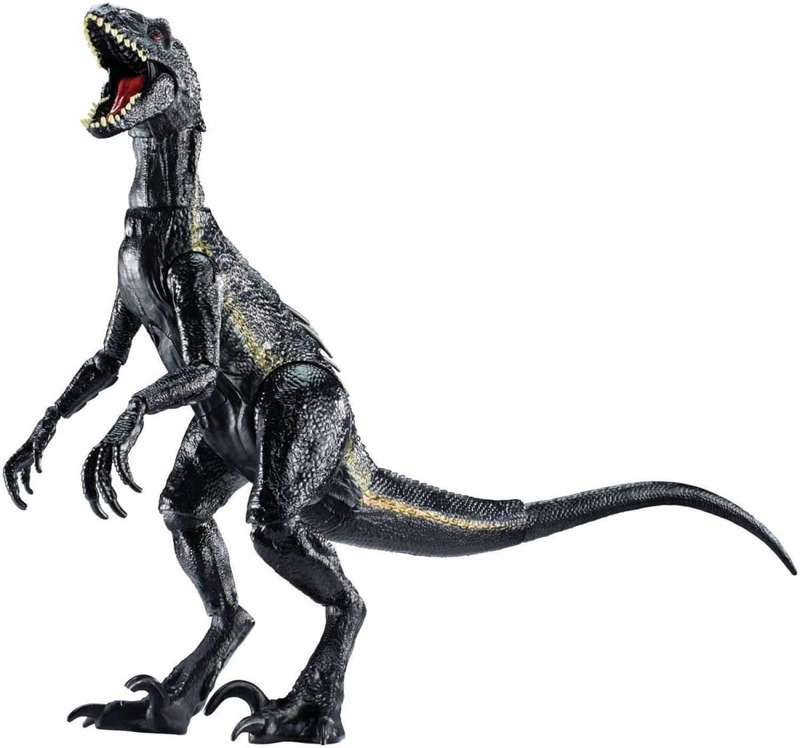 This awesome figure is an exact replica of Jurassic World’s Velociraptor. It features realistic jaws, claws, and skin texture. The jaws can move so your child can use it to chomp. You can team it up with other dinosaurs in your kid’s collection for them to hunt together. It features a realistic design of the Delta the Velociraptor. It is a must-have for Jurassic World fans. It is quite durable for dino battles. There are some packaging issues regarding missing claws. 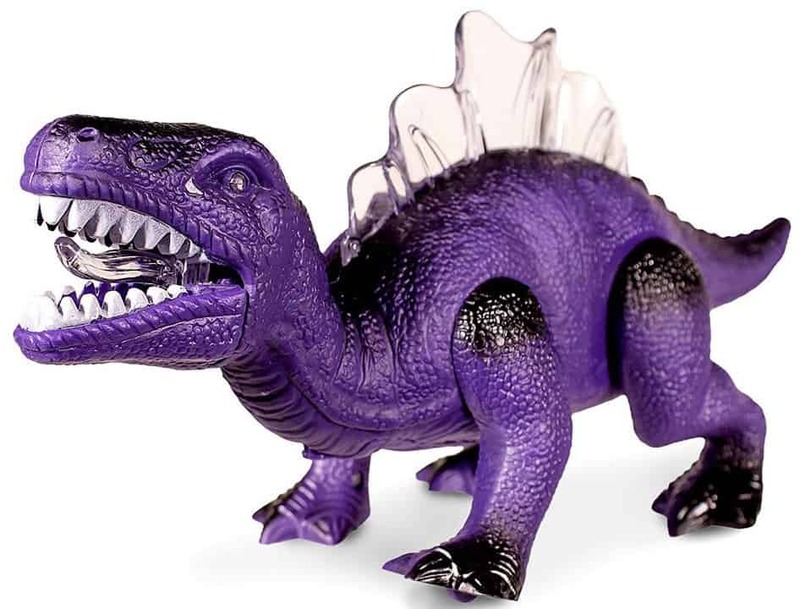 Why we like it: This is one of the cutest dinosaur toys on the list. It has been constructed from soft, high-quality plush, which makes it adorable and cuddly. 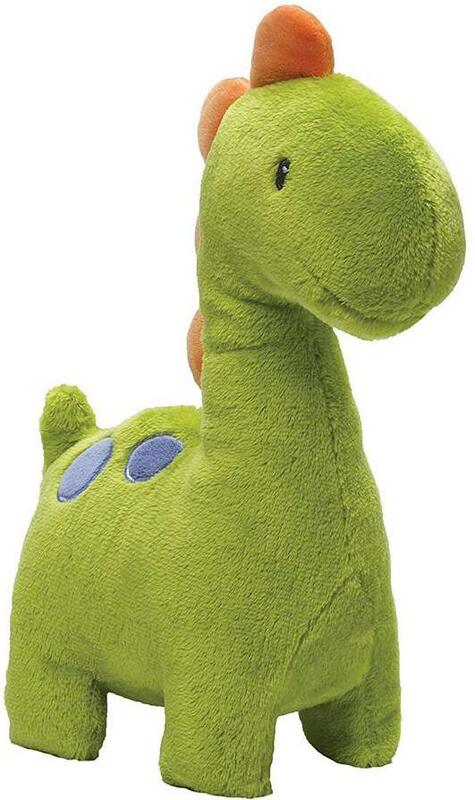 This adorable Ugg Dinosaur is machine washable and suitable for toddlers. Your child can snuggle with this toy. It features vivid and very vibrant colors. The eyes are embroidered so that it does not contain parts that may end up being choking hazards to children. It is soft and can be used as a stand-in pillow. It appears very vibrant with the vivid colors it has. It does not contain any choking hazards due to the embroidered eyes. There were some issues regarding the age of the toy. Why we like it: This building kit recreates one of the most thrilling moments from Jurassic World, the ‘Indominus Breakout. This building kit comes with the impound, a helicopter, pallet, the ferocious Indominus Rex, a gyro sphere, four mini figures, an ACU trooper, and Dr. Wu and a Vet with assorted weapons and accessories. The Indominus rex has movable arms, legs, and jaws to provide for interactive play. It has small parts that are suitable for use with little kids. It will help in developing a child’s cognitive abilities. It is easy to play with. 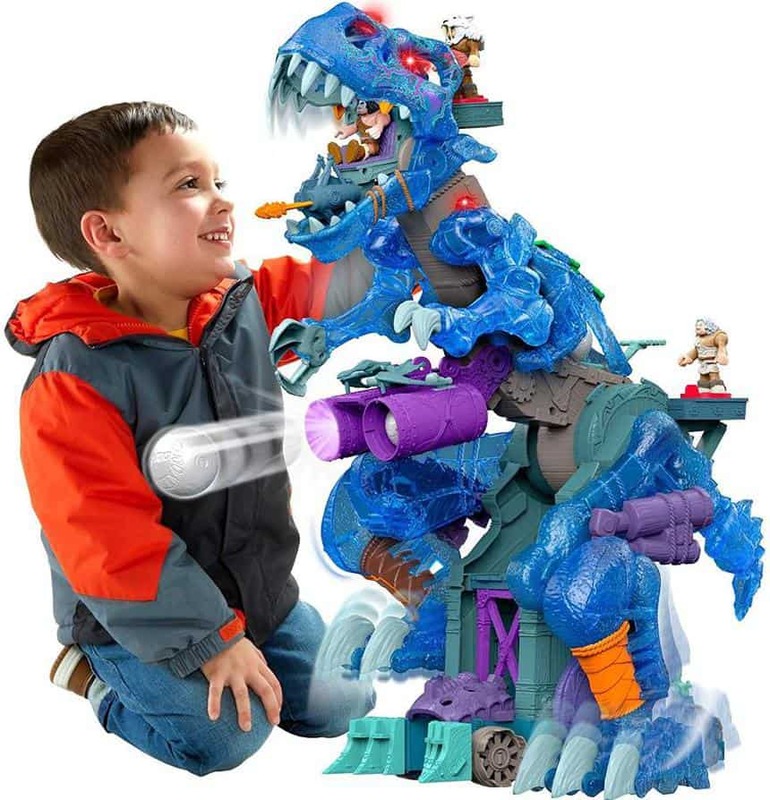 Why we like it: The Fiesta Toys Blue T-Rex is cute and cool-looking at the same time. It has been made from soft materials, which allow it to be huggable at night or while traveling. This plush stuffed animal features a very colorful design that is great with kids. In addition to using it as a plaything, your child can use it as a pillow or snuggle with it. It is quite light and tiny to carry whenever you are traveling. The soft plush material is huggable. It can be taken with you while traveling due to its weight/size. It features a colorful design for kids. It has some stitching issues. Dinosaur toys for kids and toddlers can be an amazing way to spice up their playtime and activity. They not only have fun, but children can also learn more about dinosaurs and their history in time, especially if they have a passion for paleontology. You cannot go wrong with dinosaur toys, even if you are shopping for a child you do not know very well. The toys above have different functions that will definitely have a benefit to your kids and toddlers. Some of these toys are educational whereas others are there for pure fun only. You need to take into consideration the safety, quality of materials, and price of the toy. If you are looking for the best dinosaur toy for kids and toddlers, the toys reviewed above are guaranteed to be a hit with any kid.